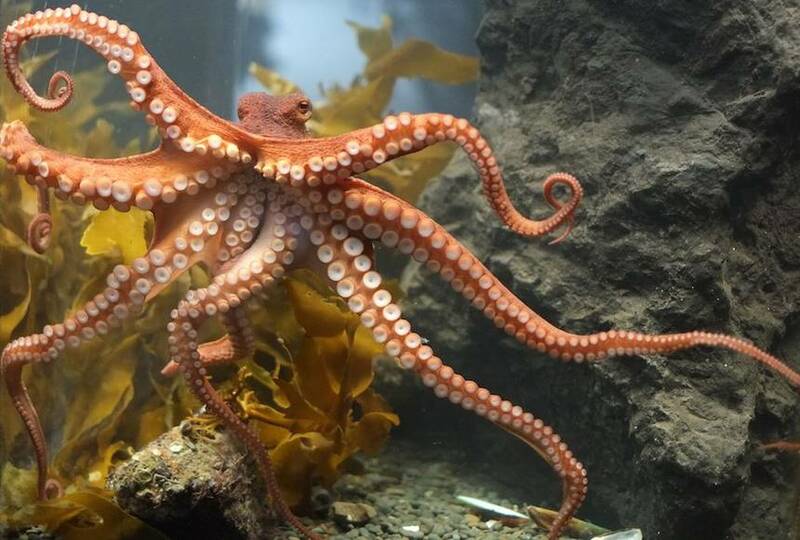 The octopus is a soft-bodied, eight-armed mollusc of the order Octopoda. Around 300 species are recognised and the order is grouped within the class Cephalopoda with squids, cuttlefish and nautiloids. Like other cephalopods, the octopus is bilaterally symmetric with two eyes and a beak, with its mouth at the centre point of the arms (which are sometimes mistakenly called "tentacles"). The soft body can rapidly alter its shape, enabling octopuses to squeeze through small gaps. They trail their eight arms behind them as they swim. The siphon is used both for respiration and for locomotion, by expelling a jet of water. Octopuses have a complex nervous system and excellent sight, and are among the most intelligent and behaviourally diverse of all invertebrates. The giant Pacific octopus (Enteroctopus dofleini) is often cited as the largest known octopus species. Adults usually weigh around 15 kg (33 lb), with an arm span of up to 4.3 m (14 ft). The largest specimen of this species to be scientifically documented was an animal with a live mass of 71 kg (156.5 lb). Much larger sizes have been claimed for the giant Pacific octopus:one specimen was recorded as 272 kg (600 lb) with an arm span of 9 m (30 ft). A carcass of the seven-arm octopus, Haliphron atlanticus, weighed 61 kg (134 lb) and was estimated to have had a live mass of 75 kg (165 lb). The smallest species is Octopus wolfi, which is around 2.5 cm (1 in) and weighs less than 1 g (0.035 oz). Respiration involves drawing water into the mantle cavity through an aperture, passing it through the gills, and expelling it through the siphon. The ingress of water is achieved by contraction of radial muscles in the mantle wall, and flapper valves shut when strong circular muscles force the water out through the siphon. Extensive connective tissue lattices support the respiratory muscles and allow them to expand the respiratory chamber. The lamella structure of the gills allows for a high oxygen uptake; up to 65% in water at 20⁰C. Water flow over the gills correlates with locomotion, and an octopus can propel its body when it expels water out of its siphon. About forty days after mating, the female giant Pacific octopus attaches strings of small fertilised eggs (10,000 to 70,000 in total) to rocks in a crevice or under an overhang. Here she guards and cares for them for about five months (160 days) until they hatch. In colder waters, such as those off of Alaska, it may take as much as 10 months for the eggs to completely develop. The female aerates the eggs and keeps them clean; if left untended, many eggs will not hatch. She does not feed during this time and dies soon afterwards. Males become senescent and die a few weeks after mating. Most young octopuses hatch as paralarvae and are planktonic for weeks to months, depending on the species and water temperature. They feed on copepods, arthropod larvae and other zooplankton, eventually settling on the ocean floor and developing directly into adults with no distinct metamorphoses that are present in other groups of mollusc larvae. Octopus species that produce larger eggs – including the southern blue-ringed, Caribbean reef, California two-spot, Eledone moschata and deep sea octopuses – do not have a paralarval stage, but hatch as benthic animals similar to the adults. Octopuses have a relatively short life expectancy; some species live for as little as six months. The giant Pacific octopus, one of the two largest species of octopus, may live for as much as five years. Octopus lifespan is limited by reproduction: males can live for only a few months after mating, and females die shortly after their eggs hatch. Octopus reproductive organs mature due to the hormonal influence of the optic gland but result in the inactivation of their digestive glands, typically causing the octopus to eventually die from starvation. Experimental removal of both optic glands after spawning was found to result in the cessation of broodiness, the resumption of feeding, increased growth, and greatly extended lifespans.